HOW TO COOK A RAT, RECIPE MADE NECESSARY BY OUR POLS IN D.C. And the PENTAGON. And their WALL STREET cronies. Bush's war, started with lies, 911 and Saddam's Nukes, a war continued by Obama and Trump, costs us tax payers 90 billion every few months, til now it's cost 6 trillion. If things continue at that rate, the USA will be broke in two years. In spite of their new tax law that hits the middle class and pardons the rich. So looking ahead, to a world without consumers, factories, industry, employment and house payments and car payments made on time, you want to earn to eat simpler foods. Mice aren't that bad. Really, it's the OTHER white meat. Delicious, especially with chilies and tortillas! It's all how you look at them. When the big crash that has to come to pay for all the wars and bombings hits, you're going to drool for any extra mice running around your house. And make no mistake, those rats deserve to die. They’re predators. And are predated by FLEAS which carry BUBONIC PLAGUE. Plus they eat us out of house & home! Those ORANGES in the trees that get hollowed out, peels dropped, perfectly eviscerated, that’s RAT DAMAGE. Avocados, any fruit tree you have will be stripped by rats. I have 20 cats yet rats strip my trees! So get your kids some BB guns, and send them outside at night with flashlights to nail the varmints. Just don’t tell children that tomorrow’s enchiladas will be made of rat meat. Just stack the corpses under a towel until the kids go to school. Keep the cat off them and make the burgers when nobody is around! Google Image the ways that CHINESE cooks butcher and COOK RATS . But RAT SOOEY? You'd prefer MEXICAN FOOD. WHO DOESN”T? A recipe for enchiladas your kids will adore! 6 corn tortillas 6 mice parboiled, stripped, boned, chopped, seasoned. Make regular enchilada sauce by soaking dried chiles(not seeds or stems) then grinding them in their own pot liquor, and straining well to separate the chile skin from the chile'sred fleshy meat. Then, fry onions;throw this red mushy sauce in for l minute. Set aside. roll. Set rolls in a dish, line all six up. Pour remaining sauce on top. olive. Bake l5 min at 350. Festoon with Cilantro. Serves two. have learned to make do with DICED FIELD MICE. Take 4 potatoes, boil, mash, and season, add cream, mash some more, line 8"
eating. No Buick upholstery or graveyards. Boil wi. Onion, parsley, carrot type mirapoix. cracker crumbs, l egg, (reserve l tsp for topping) making a loose burger. chopped olives, a dash of catsup or tomato sauce. 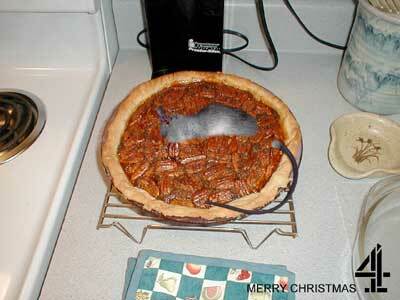 Fill the pie with chunks of savory mice meat. Cover with more potatoes. Use egg/cream to wipe down pastry top of pie so it toasts brownish in oven. Many do this after a half hour of baking, as you don't want the toasty part to blacken! Remember, a rabbit is just a big rodent. The taste of the flesh is identical. Ask any concentration camp senior! We who live near San Pedro Port/ harbor get a rare treat! The NORWEGIAN RAT is so large (size of an adult siamese cat,) that it can be barbecued on a grill. Family members see that covering of toasty barbecue sauce and think they're eating a skinny chicken! The trick is this: the rat's rib cage is much much longer so you have to break chest section off at a reasonable facsimile of a chicken's length in the corpse stage. NOTE: NEVER let your family see you chopping or peeling a rat. They lose faith in you! The neck is the dead giveaway. It's way chunkier than any chicken they ever saw. Take it off at shoulders, give it raw to a cat at far end of property. Of course FOUR DRUMSTICKS is also a major giveaway. But kids don't count, thank God, having grown up on the Colonel’s buckets which can be eight legged. TIP: when cooking rodents, pre-soaking in herbal marinades solutions with vinegar, soy, sherry, lemon, orange, onion, garlic, your a standard marinade, up to 5 hours helps take away that pesky rodent flavor. AND the longer you cook it, with the other ingredients, the better the meat tastes. When I was raising four children as a single mother, (I never let their Spaniard father get our L.A. address, as I'd fled him,) I used to pick purslane (Berdolagas in Mexican) which grew on all curbs between the sidewalk slabs. They loved to eat it in garlicky tomato sauce until one day the kids saw me picking the greens. They said "MOM are we that poor? DOGS PEE THERE!" After that I had to eat it all myself, so that's what I mean about children not knowing stuff. My boys unconsciously went along with the food-providing however and brought home the bacon any way they could. They used to Hawaiian sling up braces of corbinas in Malibu surf. They'd peel abalones off the rocks. Dig clams out of the lowtide beach sand. We'd meet the sportsfishing /tourist boats on the pier at noon and ask if any undersize specimens were on hand. We also got the over-limits fish which had been left by tourists in the boat's bait tank. They were always loaded with extras and we got them. Sigh! We had our childhood at the same time only I was more aware of putting food on the table 3 x a day! They just thought they were having riotous fun! Finding foods our forebearers et ! Cultured tastes we must forget! Will be primary on our list. by each houseguest she gets kissed! <===== BACK TO THE FUTURE INDEX PAGE, SEE WHAT’s COMIN AT YA!